And this is what I’ve spent all my free time doing for the past few days. I can already play my first song! I play it very slowly, but still. 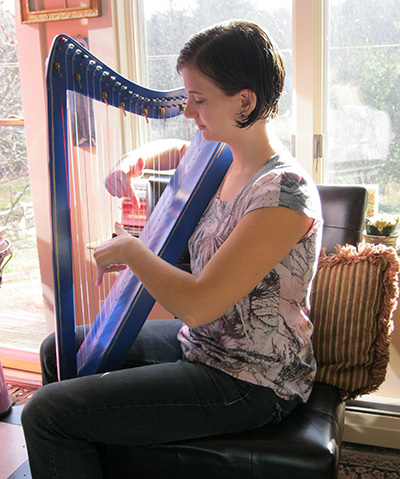 That harp is a Harpsicle, a quality instrument designed to be lightweight and inexpensive. They also come in pretty colors! See their website for more details: http://harpsicleharps.com/. On Wednesday I paid to rent the harp for two months, and I have another lesson in two weeks. The Harp Lady gave me two songs to work on, in addition to working on form and hand placement and all that. It’s fun and challenging and… it’s a harp. Even when I’m just playing chords, it sounds so nice. So far, I am loving every minute. Thanks! With two weeks in between lessons and the amount of time I am spending playing every day, I have to be careful not to develop bad habits before I see my teacher again. You should do it! I’m amazed at the speed at which, after sending one email, “playing the harp” transitioned from a dream of far-off someday to something I do while drinking my coffee every morning.